Here’s a question for you! How would your working day improve if you could analyze the composition of your feed, forage and seed anytime, anyplace, anywhere, in real-time, with instant results? Our guess is, it would change not only your working day, but your whole working model! How can you do it? 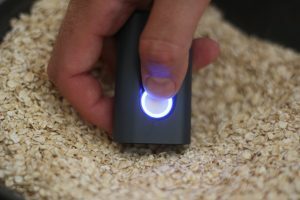 Meet SCiO, the world’s first NIR Spectrometer that fits in the palm of your hand. Ultra-compact, affordable, and easy to use, SCiO brings lab-grade material analysis out of the lab and into the field – where you want it, when you want it. Brian is a dairy farmer with a herd of 150 Friesians. Brian loves his cows, but he doesn’t love the cost of feeding them. Brian used to use an external lab to test his silage and feed, but this was time-consuming and costly, so testing was done at a minimum. He also relied heavily on a nutritionist to help determine rations. That was before Brian was introduced to SCiO. Since using SCiO on the farm, Brian has increased his silage testing four-fold – to once a week, rather than once a month. And Brian tests fodder and forage plants for major macro-nutrient parameters both in the field and in storage whenever he feels he needs to. And as SCiO is so easy to use, anyone on the farm can use it with minimal training! SCiO also gives Brian vital information about the exact composition of the feed being fed to his cows. He knows the DM, crude protein, ash, fat and starch and more, instantly, and now makes decisions based on the results on the spot! 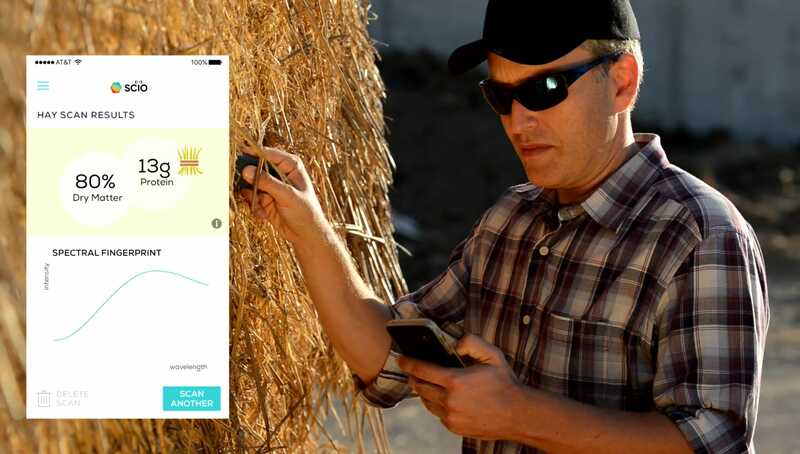 Brian can now respond in real-time with both precision and consistency, and his cows get a better ration. Indeed, since using SCiO, Brian has reduced his feed costs, reduced his feed and supplement waste, improved the general health of his herd, and increased his milk production. Milk output increased. Herd health increased. Lab costs decreased. Feed costs decreased. Now Brian’s happy, and so are his cows! Tom is the innovation director at a large agricultural company. To beat his competitors, Tom needs to produce the best quality feed and supplements. To achieve his KPIs he needs to increase productivity, profitability, and reduce wastage. Tom used to use lab sampling as a key measure of quality control. But Tom is an innovator, and he’s always looking to improve and expand quality control opportunities. By deploying multiple SCiO devices, Tom measures quality at every stage of production, from acceptance of raw materials, to analysis during and after treatments, and on to the final product. Produce is measured for major macro-nutrient parameters; crude protein, oils, dry matter, moisture, ash, energy and more, instantly. Sampling points have increased, time lag and response time have reduced. Since using SCiO, Tom has seen tighter production control, better product quality, decreased off-spec products, and a boost to his bottom line. Joe is an agricultural consultant. Joe provides expert advice to farmers and farm managers on how to improve crop quality, livestock nutrition, and profitability. He has a large number of farms on his books. Much of Joe’s day is taken up traveling, sampling, and chasing up lab results. Mileage and delayed lab response time are a big frustration for Joe. Recently, Joe got a SCiO. Now Joe has instant access to material analysis directly where he needs it – no sample prep or manipulation with chemicals, solvents, or reagents. No sending samples to the lab and waiting for results, just instant, reliable, non-destructive material analysis on the farm and in the field. 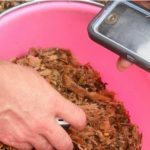 SCiO gives Joe instant real-time results. Joe now verifies nutrient content in fertilizers and animal feed. He measures Brix in fruits & vegetables. Results are returned in seconds – no time lag between sampling, analysis and result. 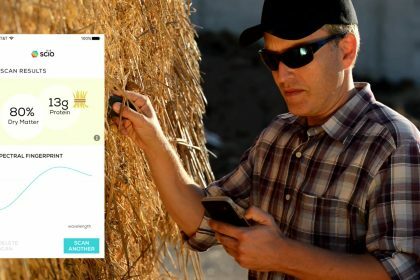 And Joe now analyzes crops on site before and after harvest, providing quality crop management advice with the easy and accessible data SCiO provides. No lab sampling – no delay – no frustration. Now Joe has more time for quality consultations and research, and he’s finding his job a lot more satisfying and rewarding now he can give instant answers and real-time advice.